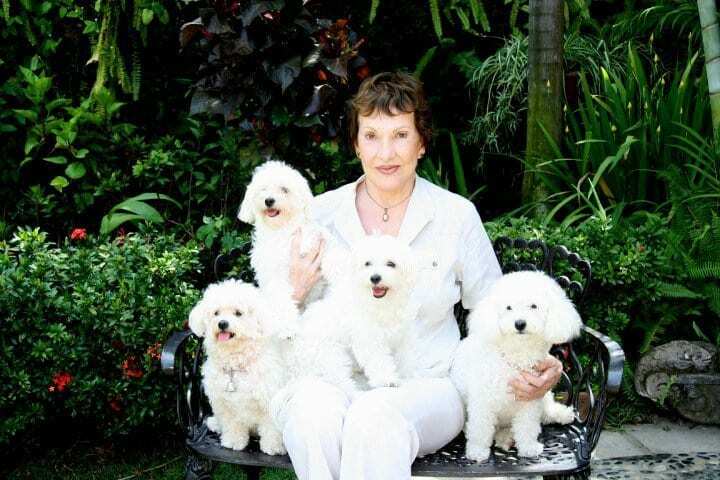 Janice Chatterton, founder and President of the SPCA Puerto Vallarta, did in life what few do. She helped to change an entire culture and has saved lives. 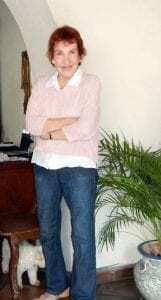 Chatterton, who was in her eighties, recently passed away after a sudden illness. Her sheer determination to rescue animals in need has saved a few thousand dogs and some cats too. She also helped to change the culture in Puerto Vallarta and the Mexican state of Jalisco. And in doing so, her legacy includes that today dogs and cats are more often thought of as family members. While, sadly, maintaining dogs on hot rooftops and allowing them to roam in the streets still occurs, arguably it’s Chatterton’s dogmatic public viewpoint which has infiltrated local culture. The Sanctuary which Chatterton opened in 2012, is what Americans and Canadians define as no kill. Many dogs are rescued from abuse, and on many occasions, she was known to take matters into her own hands. While she was alive, I couldn’t print those stories for fear of potential legal repercussions. 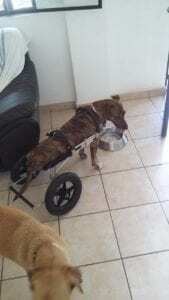 Any dog in need can find a safe haven, including dogs with special needs. Dogs with special needs may stay longer at the sanctuary compared to those adopted in weeks or months, but their lives are enriched by caring staff and volunteers. Simply, put, they learn what trust and love are. Meanwhile, medical care of all animals have been attended to by a staff veterinarian, which is not common place in Mexico. 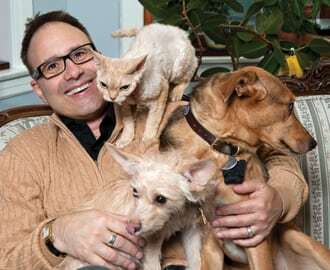 Chatterton has even flown dogs to Mexico City or to the U.S. to see veterinary specialists. If it’s possible to care for the dog at the sanctuary, they do it. There are dozens of miracle stories. According to one witness, Carmen was hit by a car. The driver got out to examine any damage to his vehicle but left Carmen to suffer at the side of the road. By the time Chatterton heard about Carmen, she was starving – but so determined to stay alive she actually had eaten her own flesh. Instead of euthanizing, Chatterton treated, which meant amputating her back legs. As Carmen recovered, there was a “cuddler” with her 24/7 to provide both medical care and love. What shelter does that? Chatterton felt dogs who are suffering should never be alone. Once recovered, Carmen would greet all visitors to the sanctuary, but she did suffer night terrors and likely post-traumatic stress disorder syndrome. 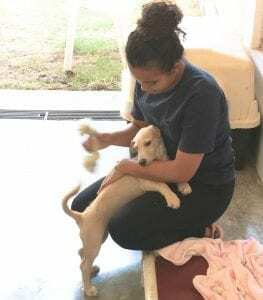 Some might suggest she was destined to live her life out at the SPCA Puerto Vallarta as no one would adopt a dog missing two legs. And that would be fine with the SPCA and with Carmen. It’s not a horrible place to live; her needs were met, doted upon by volunteers and staff, and obviously there’s canine company. But it’s still not the same as a loving forever home. When Kathy Mackel walked into the facility for the first time, Carmen was there to greet her. Kathy came to the SPCA several times in 2016 to deliver wheelchairs for dogs, including Carmen’s, from Eddie’s Wheels. Each time she departed, Kathy went home thinking about Carmen. They had formed a bond..
And, that worked both ways, as at the time—unbeknownst to Kathy—staff would report that whenever she didn’t return the next day (because she was on her way home to Oregon), Carmen would act “depressed.” They pined to be with each other. Kathy wound up adopting Carmen, and they are today inseparable. Somehow Carmen rolled right off the plane into the family as if it were meant to be all along. How Did a Fancy San Francisco Lady Come to Save So Many Animals? Living in San Francisco, Chatterton enjoyed animals, but was never involved in animal welfare, or intended to be. 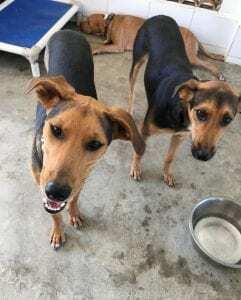 In 2007, by which time Chatterton was living in Puerto Vallarta, she agreed to join some friends to help at the city pound, mostly as a social get-together. She was horrified by conditions at the facility. Chatterton and others developed a program where after the shelter spayed/neutered, dogs, they were taken to public places and events to be adopted. Chatterton opened La Casita, a small private sanctuary in Puerto Vallarta for animals she began to rescue, and hasn’t looked back. She hired staff with her own money, and began to enlist volunteers to help rescue animals, adopting them out to mostly Americans and Canadians, a formula which would ultimately become her model. Many fundraisers later, Chatterton established and opened the much larger SPCA Puerto Vallarta Sanctuary. Dogs are kept in spacious kennels, and always have the choice of being indoors or outside. They have playtime, and attention nearly 24/7 from a staff of about 20 employees, and volunteers. Classical music plays in the background, and there’s a warm water whirlpool for rehab. And each dog is taken for a walk daily. 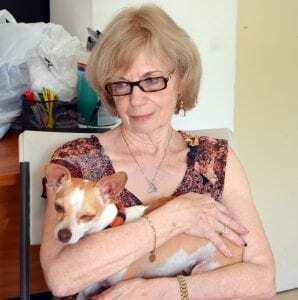 For several years, the SPCA Puerto Vallarta also adopted cats, but because there are now other organizations in town that effectively save cats, she began to focus solely on dogs. In Puerto Vallarta, Chatterton has helped establish the concept of ‘voluntourism.’ The Sanctuary welcomes tourists willing to spend a good part of a day volunteering at the facility. Many wind up adopting a new BFF. Chatterton became expert at the process of transporting animals to the U.S. and Canada. Chatterton has even developed a foster home network of U.S. and Canadian homes. Once they’ve landing in one of these homes, animals always get adopted. 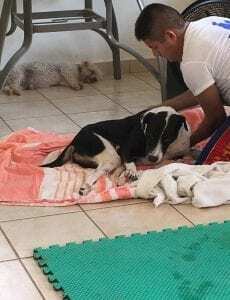 Chatterton rarely adopts to anyone in Puerto Vallarta for many reasons, including the fact that there’s already an over-abundance of animals available to locals from other facilities. Chatterton also co-owned very successful elegant boutique hotels in Puerto Vallarta called Hacienda San Angel (a property where Richard Burton once lived) and Casa Kimberly (a property once owned by Elizabeth Taylor). From Edmonton, Canada Bruce and Carole Thom, a retired couple with grown children, decided to adopt from SPCA Puerto Vallarta. They were so impressed they did it again with a dog named Nina. It turned out that Nina had a bad habit; she bit people. The Thoms refused to give up on the dog. 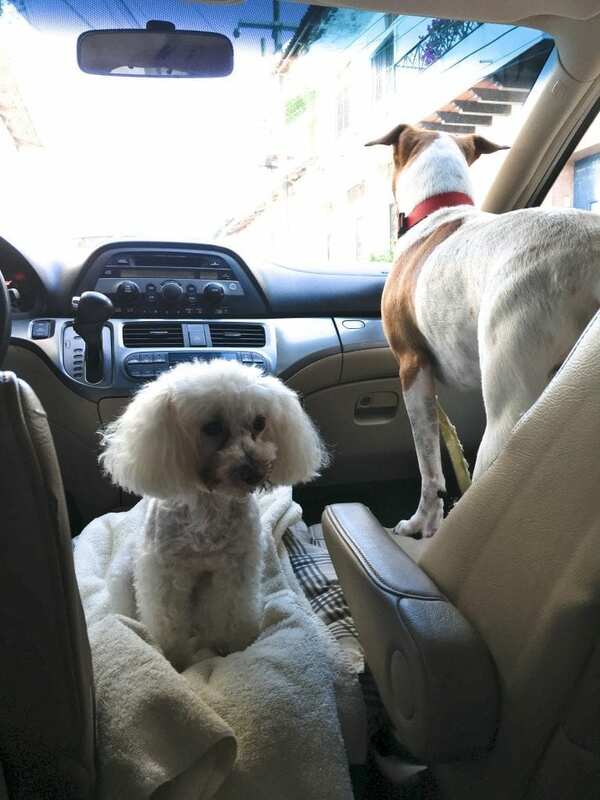 Carole says that she realized her pup was simply fearful. She found qualified help from a trainer with a special interest in animal behavior, and today they manage Nina. “Sometimes things happen for a reason,” she says. “Nina taught me so much about dogs. 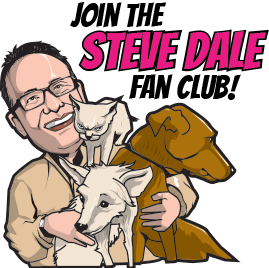 And that’s allowed me to help other dogs (from the SPCA Puerto Vallarta).” The couple helps to organize adoptions and foster families in Edmonton and Alberta, Canada. Chatterton was a slight woman with a giant mission. She wasn’t forgiving about accepting the ordinary, at times it seemed most couldn’t live up to her standard. Compromise is a word that likely may not have existed in her vocabulary. Still, many worked very hard to merely to receive her acknowledgement. When they heard that from Chatterton they knew it was the truth. The last time I saw Chatterton, I asked ‘Why do you still work so hard?’ She simply stared at me and smiled, and finally said, “I think you know.” And of course, I did. The work must continue. If you are so inclined, as we will do, please consider a donation. Here are two of the videos I recorded with Janice. She didn’t love doing this sort of thing, preferring to be behind-the-scenes, but she understood the need for it. Hopefully you get a sense of her passion, and willingness to do whatever it takes. Super hero rescuer Stephanie Dubinsky has personally delivered well over 100 dogs to Canada, from the SPCA Puerto Vallarta. Kathy Mackal and her love story with Carmen. He may have lost two legs, but he sure found love with Mackal. They saved one another. Kathy gets emotional talking about Janice two years ago. Listen HERE to a podcast with Nicole Martin explaining how the Sanctuary came to be. Read more about the SPCA Puerto Vallarta.